Hello from Bill Snyder Family Stadium. The latest Sunflower Showdown is set to start in 25 minutes. My prediction was a 24-21 win for Kansas State. Who do you think wins this game? Kansas has been within two scores in each of the last two meetings, including a 10-point loss in Lawrence last year. Never been happier to be in a press box. We're in Manhattan, so #KUfball team met with boos as it runs out of the tunnel. Usually fans in opposing stadiums don't care 1 way or another when the Jayhawks run out. K-State wins the toss and defers... #KUfball will receive and open this year's Sunflower Showdown on offense. Here. We. Go. KU goes play-fake on first play. A dreadful opening series for #KUfball goes 3-and-out in 90 seconds... KU will punt. It's 3 and out for KU offense on first possession of Sunflower Showdown. 2 short completions for Bender and a sack. Three plays, and then a punt for KU on its opening drive. Alex Delton at QB for K-State. K-State misses a 53-yard field goal attempt. K-State QB Alex Delton and one of his linemen exchanged a few words after that failed 3rd down try... #KUfball D forced KSU to try a 50+ yard FG and it missed short. Like I said a bit ago... Here. We. Go. Win for the KU defense. K-State can't pick up more than a 1st down on opening drive. Dom Williams with a couple carries to open this series. KU at least picked up a 1st down on 2nd series -- a Bender pass to Robinson. I see getting fired didn’t track Beaty anything about playing football! K-State goes 3 and out. Holani, Lee and Dineen with the stops for KU's defense. Booming punt follows though. 61 yards. 911 what is your emergency. Please send somebody to replace Beaty! Nice run by Herbert there gains 15 additional yards thanks to a facemask penalty on the Cats. Tough run got tough yards. #KUfball trying to put together a drive after the 2 teams have exchanged punts early and often. Out of timeout, KU goes pass. Bender incomplete as he looks for Sims on the left side. KU still punts from own 45. 3 possessions, 3 punts for KU. Tough flag on #KUfball there... Delton was clearly heading out of bounds but he had not stepped out yet. Torneden can't be asked to pull up in that situation. 11-yard Alex Banes rush. Felt like the longest play of the day for either side. Obviously forgot about Reuter's 12-yard catch. My first quarter takeaway: I predicted far too many points when I said K-State would claim a 24-21 win. K-State punt downed at the 2 yard line. Bender in end zone taking snap. Hands off to Dom Williams for 1 yard. End of 1Q. #KUfball No score. So you've already been fired, have a fourth and 1 at midfield in a rivalry game and still punt? That's yet another defining moment. If you are a Coach already fired, why not go for everything? How many 2 yard passes can we throw. Count the box, KSU has 9 guys within 3 yards. Friggin throw it take a chance! K-State offense with 46 yards in 1Q. One quarter in the books over here in Manhattan. No score. #KUfball opens the 2nd quarter with a 2nd and 9 from its own 3 yard line... 77 total yards and 6 first downs between the two teams in that opening quarter. 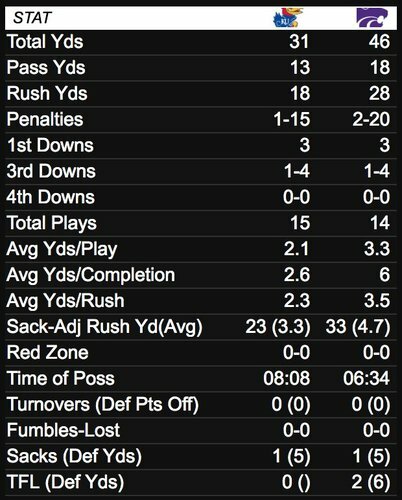 KU averaged 2.1 yards per play in the first quarter.